Houghton Mifflin Harcourt, 9781328482471, 256pp. Indian food is everyday food! 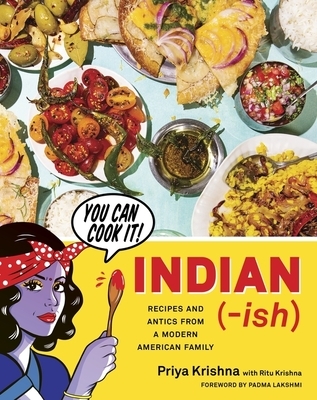 This colorful, lively book is food writer Priya Krishna’s loving tribute to her mom’s “Indian-ish” cooking—a trove of one-of-a-kind Indian-American hybrids that are easy to make, clever, practical, and packed with flavor. Think Roti Pizza, Tomato Rice with Crispy Cheddar, Whole Roasted Cauliflower with Green Pea Chutney, and Malaysian Ramen. Priya’s mom, Ritu, taught herself to cook after moving to the U.S. while also working as a software programmer—her unique creations merging the Indian flavors of her childhood with her global travels and inspiration from cooking shows as well as her kids’ requests for American favorites like spaghetti and PB&Js. The results are approachable and unfailingly delightful, like spiced, yogurt-filled sandwiches crusted with curry leaves, or “Indian Gatorade” (a thirst-quenching salty-sweet limeade)—including plenty of simple dinners you can whip up in minutes at the end of a long work day. Throughout, Priya’s funny and relatable stories—punctuated with candid portraits and original illustrations by acclaimed Desi pop artist Maria Qamar (also known as Hatecopy)—will bring you up close and personal with the Krishna family and its many quirks. PRIYA KRISHNA is a food writer who contributes to The New York Times, The New Yorker, Bon Appétit, and more. She is also the author of the college-centric cookbook Ultimate Dining Hall Hacks, and formerly worked for Lucky Peach. She lives in New York City; her mom, Ritu, lives in Dallas.